Japan is well known for leading the world in technology and of course robots are no exception. Int he future they are set to replace our reception staff, our manual workers, care workers…and even, perhaps, our artists? 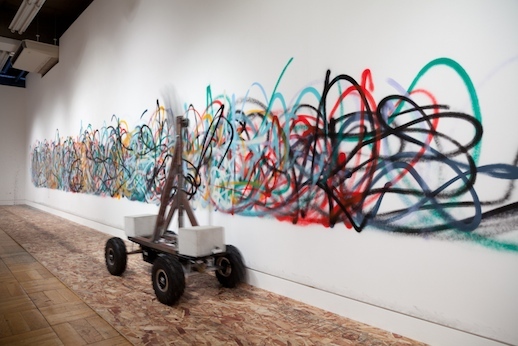 As part of the “Utopia Announcement” (Yutopia to shirase) exhibition that recently ran at Akibatamabi 21 in Chiyoda 3331 earlier this month, artists So Kanno and Takahiro Yamaguchi created this remarkable wall-painting robot. Nay-sayers may just counter that the innovation is, in the words of its title, rather “senseless”. Well, the jury’s still out whether the ‘bot can create the new “Guernica”. You can see more photos of the robot on Flickr.